The Agony and the Ecstasy – Did You See That One? 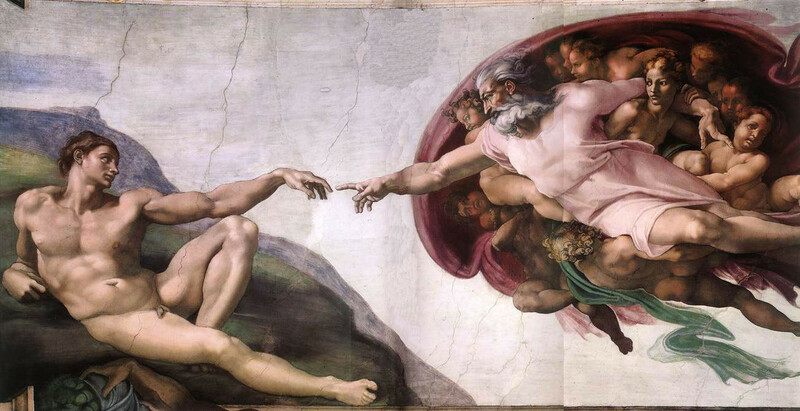 At the insistence of Pope Julius II (Harrison), Michelangelo (Heston) begins working on painting the ceiling of the Sistine Chapel. This genius artist soon begins to clash with the powerful and demanding Pontiff. Their clashes continue as Michelangelo continues to craft his masterpiece. Irving Stone (Lust for Life) initially penned his book The Agony and the Ecstasy in 1961 as a biography of Michelangelo Buonarroti. (Stone is also known for a book on the life of Vincent van Gogh titled Lust for Life.) The Agony and the Ecstasy would later serve as the starting point for Philip Dunne’s (The Ghost and Mrs. Muir) story and screenplay for this film. Oscar winner Carol Reed (The Third Man) took on this film as director. 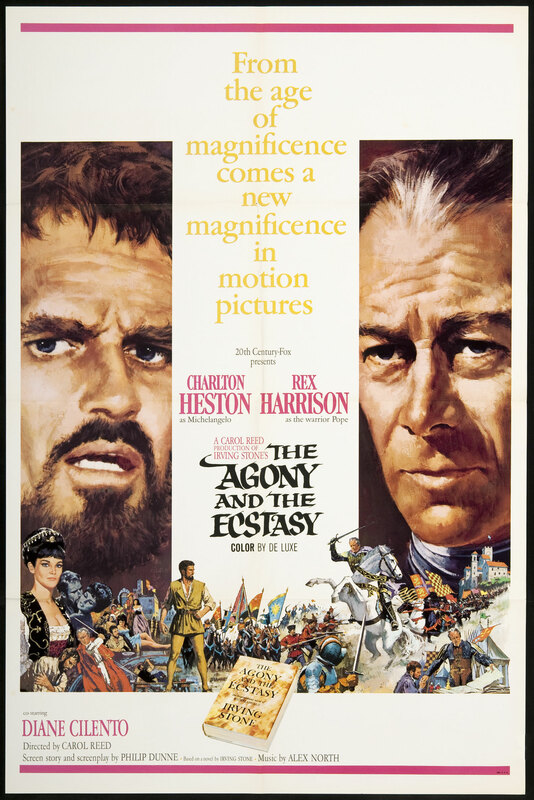 The cast includes Charlton Heston (The Greatest Show on Earth), Rex Harrison (Cleopatra), Harry Andrews (The Hill), and Diane Cilento (Hombre). This story brings a mix of history and Hollywood fiction together with mostly good results. The film starts with a mini-documentary designed to set the stage. This includes some really great visuals filmed to show some of Michelangelo’s work. The story focuses on the troubled relationship between Michelangelo and the militant Pope Julius II. The writing does a great job creating a workable tension between the two. The dialogue is strong, and allows the two stars to create nice chemistry. The change within the characters in this movie really reflects the passage of time nicely as well. Many of the minor characters in this one come and go, but nothing feels out of place. The one issue this story has is finding enough important moments over the span of time in the story. The fictional aspects of the story handle some of that need nicely. Overall, this is a nice historical epic. The acting in this movie is really pretty solid. I wasn’t sure that Charlton Heston could pull off the troubled artist, but he does good work. His performance includes some intense moments of creative frustration that the story really needs. He also has incredible chemistry working opposite Rex Harrison. Harrison is the stronger of the two stars in this movie. His performance actually takes up an equal portion, if not more of the film. He is able to bring something brutal and unforgiving to his early scenes in the film. As the story goes, Harrison’s performance makes excellent adjustments to account for his character’s advancing age and changing personality. The rest of the cast also does nice work, but this is really a story about two men at odds with one another. Harrison and Heston do a great job bringing it to life. This film features some incredible visuals. The matte paintings in this movie are some of the great examples of the skills of Hollywood artists of the era. In addition, Irish artist Niccolo d’Ardia Caracciolo was hired to create Michelangelo’s work for the film. The movie also found the right locations and set design to really bring this story to life. The film also earned Oscar nods for Best Costume Design and Best Set Decoration. In addition, Leon Shamroy (Twelve O’Clock High) earned a nomination for Best Cinematography for his skill in capturing all of these visual elements through the camera’s lens. The score, composed by Alex North (A Streetcar Named Desire), is a nice mix of original music and music taken from the era. He earned an Oscar nomination for Best Score – Substantially Original for this film. The film would earn it’s fifth and final nomination for Best Sound. This film fits the definition of a Hollywood epic from almost every angle. The story spans dozens of years, and the subject is a major historical event. If you’re a fan of the classic epics this is one you should see. I would also suggest this one to fans of Heston or Harrison. This is a classic that drama fans should also check out. I give this one 3.6 out of 5 stars.